Sandra Menning, Tomas Pena and Noel Menning. Photo by the author. Conversations XIX – XXI of 30 Encounters with 30 Americans demonstrates that education in the arts is a life-long experience. Robin Brown visits the Museum on August 28, 2013. Photo by the author. 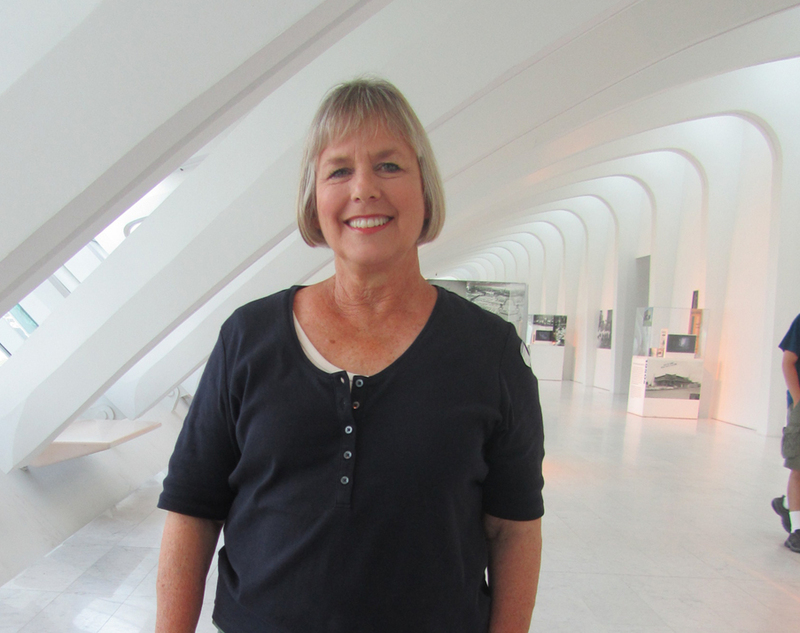 Robin Brown is a mother visiting the Milwaukee Art Museum from San Luis Obispo County, California. She returned to school later in life to pursue her “first love,” art. Since then, she has wasted no time in establishing herself as a multi-talented artist in the fields of 2D and 3D design, painting, printmaking, ceramics and bookmaking. Robin currently travels the country in pursuit of her next artistic inspiration. Robin: I loved it. I really enjoyed the perspective of the exhibition because it put that particular group of artists together and that it is very contemporary. I thought it was very, very interesting. It was within a specific group of people, yet it felt very diverse… This exhibition could appeal to anybody who enjoys art. I am very interested in the history of African American art and the perspective that they bring, especially years ago. I really enjoyed the perspective that these artists brought to their work. A lot of it is very narrative, which I always like. Robin: Oh I would say, “Definitely come and see it.” I became interested in the exhibition when I saw the little snippet on the Museum website. I knew these artists were coming here and I wanted to find out what I could see. So, I came specifically to see 30 Americans, but I was glad that I ended up looking around the rest of the facility. Robin: Kerry James Marshall – I really enjoyed his artwork and when I get home I will do more research on him… Also, Kehinde Wiley was someone that a life drawing teacher of mine had shown a lot of his work and thoughts about his process [during class]… He is a very contemporary portrait artist, yet he adds a different play, or two, to his work. My teacher said that Kehinde Wiley has his backgrounds painted in China… I thought that is definitely a modern take and, then, he puts in the figures. I think it is really beautiful work [such as Triple Portrait of Charles I and Equestrian Portrait of the Court-Duke Olivares]. It really has a presence. I think a lot of the 30 Americans artwork really has a presence. Sandra Menning, Tomas Pena and Noel Menning visit the Museum on August 21, 2013. Photo by the author. Sandra: The exhibition is interesting, and it also makes you think. Well, for me, it brought back some memories I did not know what I was going to see when I first went in. This is our second time to the exhibition… Thomas was almost afraid when he found out what it meant. I had to explain some things to him [Thomas], which he did not understand… He was kind of upset… He was almost too afraid to go into the room with the stools [Duck, Duck, Noose by Gary Simmons]. Normally, I will not even talk about it. Some things like that you do not want to even talk about. But, I had to explain the history to Tomas. So, I tried to remember what happened. Tomas: [The exhibition] is kind of cool. You know when you first walk in, there is like this round thing with all the paintings, and over there is like the shadow. It is like a story, but I do not know what it is about… Well, there is one that caught my attention, the Ku Klux Klan [Duck, Duck, Noose by Gary Simmons]. It is so sad. Noel: I thought the exhibition was awesome. It reminded me of what I learned when I was younger. It had a lot about how slavery was and how people were mistreated even though they are just a different skin color, or from a different area. When I was little and I first heard of colored people, I thought there were people different colors of the rainbow. I did not know there were people who were persecuted against just because their skin is a different color. My best friend growing up was African American. So, I did not think much of it. Instead, I was told about it more as I was growing up. It did not make sense to me, how people can be so ignorant, so stupid…There are still supporters today that support slavery and Civil War… I thought the exhibit was awesome though because it talked about these issues. Sandra: I would recommend the exhibition. My daughter said, “We need to go see it today.” I thought my son would like the exhibition too. I like the colors. Although, there was some upsetting words… Of course, that is what is cool about the exhibition. Not only does it show the pain and the torture that African Americans went through, but it also shows what is awesome about African American culture. Sandra: Well, of course, the one with the stools [Duck, Duck, Noose by Gary Simmons]. That [artwork] was upsetting to think about. However, I like the one with the hair. The different color hair and how it was long hair in all different range of colors of the rainbow. Tomas:[Speaking about Untitled by Nina Chanel Abney] I wonder about portraits, like these… It is like a story. Well this one has someone who is coming out of a body, the man in this one does not have any eyes… and in this one, a lady has a plant, where a monster comes out. It’s like all the parts to the story about something. Also, this art looks like the man is wearing something with all the flowers around it [Soundsuit by Nick Cave]. [He does not show his face] because maybe he does not want to show his face and his body. Why do you think the work is faceless? Tomas: Because maybe when he grew up, he did not have a face. Maybe because he is different. Everybody sees him else different, but he does not see himself as different. Noel: Mickalene Tomas – I really like her pieces. The portraits of the heads [Portraits of Quanikah]. I really like those, and the one of the woman sitting on her bed, Baby, I Am Ready Now, which sounds very dirty… What I liked about her art when I first saw it is that it shows that these women are black and they are beautiful. I also really like all the intricate detail. I think they are very striking. Anton Carter visits the Museum on August 26, 2013. Photo by the author. Anton Carter is a bartender and self-trained artist from Milwaukee, Wisconsin. He describes his artwork as visceral abstractions. Anton: I have never seen an exhibit like that before. I guess I liked it… I think it is a good idea. Especially in our city; [Milwaukee] is such a white centric town. So, it is kind of nice to get a different perspective… I know I am not the first person to say that. Anton: Everyone should see it. There has never been an exhibit like this that I have seen before. Aesthetically or artistically, it may not be your favorite, but I think it is like required reading. You just need to see it. Anton: I was really happy to see some Jean-Michel Basquiat because I like him. I do not know why and I think that is part of his genius. This one, Bird on Money, was exciting. Then, those twenty-five watercolors [Untitled by Nina Chanel Abney]. They are cute, they are funny, they are smart and they are precise… They struck me immediately… The colors are right there. I like the simple background. Especially in the context of the exhibit. This is just sort of imaginative and fantastic as opposed to the history of racism in America, which is really depressing and real. Instead, these are just cool. I can see a t-shirt out of any one of them. Kid’s will wear them, too. You are the second person this week to mention Abney’s work. The other individual was an eight-year-old boy. Do you think Tomas would wear these designs on a t-shirt? Anton: Of course. I would wear these designs if I were eight and would be happy. Check back next week for 30 Encounters with 30 Americans: Conversations XXII – XXIV. 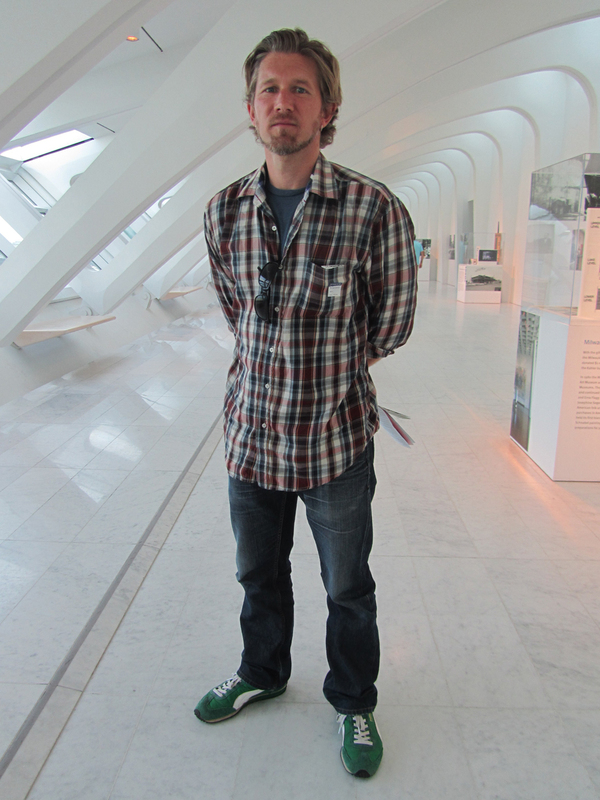 30 Americans is at the Milwaukee Art Museum from June 14 through September 8, 2013. For more information, please click here. thank you Sarah….enjoyed chatting with you! Thank you Robin – it was an absolute joy to hear your perception of the “30 Americans” exhibition. 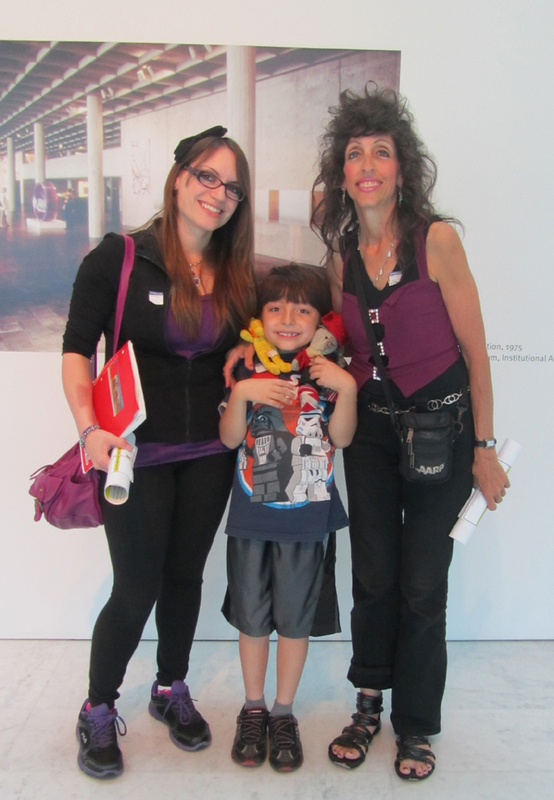 I hope you had a lovely time visiting the Milwaukee Art Museum.